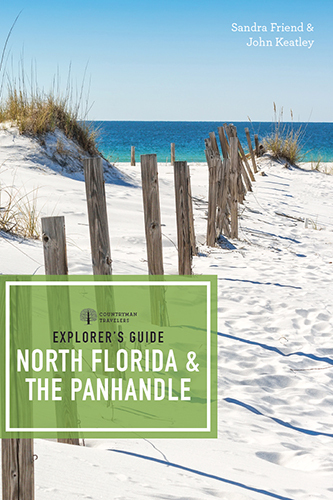 Explorer’s Guide: North Florida & the Panhandle provides in-depth coverage of an often-overlooked part of Florida … and our favorite part. We’ve always felt that North Florida and the Panhandle were Florida’s best-kept secret, where you can still swim in a spring and hear the frogs croaking from the shore, search for waterfalls along rugged tributaries, glide down a crystalline stream on an inner tube, and in general, have yourself a great time. In this third edition, John and I scoured the backroads and byways for new and fascinating destinations, local eateries, and interesting characters to meet while you’re cruising through the most authentic portions of our state. North Florida is the Old South, and it’s never more evident in towns like White Springs, Madison, Marianna, and Milton, places that retain vital historic downtowns where people still go to work and sip a cup of coffee. The genteel Old South remains intact: you’ll hear a lot of “yes, m’am” and “no, sir” up here, where live oaks and magnolias thrive and rolling acres of cotton and wheat dance off into the distance. The Panhandle is a place of natural wonder, where rugged clay cliffs rise high above clear sand-bottomed rivers, where rhododendron, azalea, and mountain laurel bloom in profusion along streams that seem straight out of the Appalachians, where columbine and trillium add splashes of color to rugged limestone slopes, where vast savannas of pitcher plants shake their draping lemon-yellow blooms in an April breeze. Welcome to the best that Florida has to offer. Slow down and savor the views. Softcover, 398 pages, full color with more than 100 images and maps. Kindle edition available.